Judge Calloway with the Tennessee Tribune Opportunity NOW summer intern, Nadia Smalley. Nashville, TN-Juvenile justice is the area of criminal law applicable to persons not old enough to be held responsible for criminal acts. In most states, the age for criminal culpability is set at 18 years. Juvenile law is mainly governed by state law and most states have enacted a juvenile code. 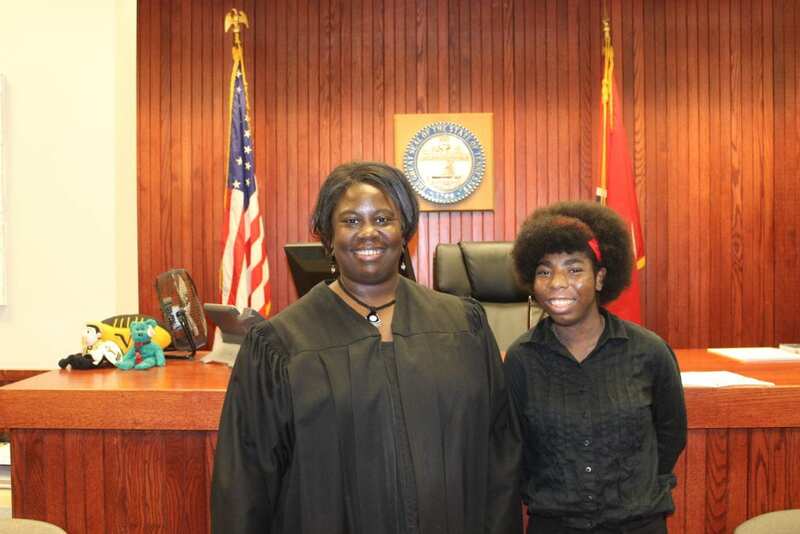 A outstanding 47-year-old African American Davidson County Juvenile Judge, Sheila Calloway, has been the juvenile judge since September 2014. Her philosophy consists of the three ‘P’s, which are: prevent problems, promote positive potential and pursue fairness. The Juvenile Court is in the importance of helping the youth from any age below eighteen to become children and adults with at least no criminal record within the court. This will help them establish a normal citizen lifestyle.“Well we are doing a lot of things for our youth to restore and divert them through the system. First off, we only have jurisdiction for children up to 18. The 18 through 24 go to the adult court. The youth that come into the Juvenile court system have a lot of different programs to help them become positive leaders and citizens in society today.” Judge Calloway said. In the court system, many children can tend to feel as if they have someone listening to their pain, hardships and heartbreaks from society, peers, or lifestyle. Unhealthy mindsets and physical health can be the result of a troubled teen if they are not aware of the beneficial aspects of youth justice. The neurology of the teens brain is the crucial reason that they may commit crimes. Therefore, hitting this head first may save the youth from getting sentence for gruesome crimes. Most importantly, to keep the youth from committing crimes, our job is to have them interact in activities that occupies their brains and provides healthy physical activities. “We have a program called GRIP, where we help teens associated with gangs to adjust themselves into gentlemen of society rather than aiming for gang violence and gang related crimes” Judge Calloway said.The GRIP is actually the first of its kind and it stands for Gang Resistance Intervention Program. This program includes probation, compliance with school attendance, court-mandated mentoring, and other requirements. The program was created by the combined efforts of the Davidson County Juvenile Court, Metro’s Police’s gang unit and support from local clergy. Youth Justice is important because it helps youth that are sent into the Justice system believe their needs and protection is met on a racial and judicial level. Youth realize that the Juvenile system is committed to true fairness among all races. “Black males have higher rates of incarceration and repeat offenses that land them back in jail or prison, statistics shows. Changing that dynamic could begin with expunging their criminal records” Judge Calloway said. African American boys and men tend to be sentenced higher than their white peers and we see this in any court system in Nashville and worldwide. However, the Juvenile court system is trying to lessen this sense of systematic racism. This will change the way the judicial and juvenile court handles youth and adults, particularly African Americans associated with criminal records. This change will help the future within communities and prison facilities. The Metro-Student Attendance Center (M-SAC) is a program that helps students improve their attendance in Metro Public Schools so that they don’t have to go to an adult jail due to dequilent actions. Judge Calloway is one of the supervisors among this program along with Probation Officers, Social Work Techs, supports staff, and Magistrate/ Director who handles and hears all of the truancy, educational neglect, and loitering cases.By connecting with the youth and their parents on an educational level, the court is able to help students with high attendance issues. All of the intervention tends to lower the truancy rates within Tennessee among the youth. This is one of the ways the Juvenile Court is keeping youth out of jail and in school while promoting safety for Nashville. As parents and guardians, we need to educate the youth and keep them active so they don’t end up in jail where they will regret the mistakes they made due to pressure or even boredom. You can contact the Juvenile Court of Metropolitan Nashville of Davidson County at http://juvenilecourt.nashville.gov as well as (615)852-8000. For more information on youth justice you can contact Judge Calloway at (615)862-8073.